To tell the truth, I was a bit apprehensive when I was given this for a review. I didn't even really know what a multi food cutter was. 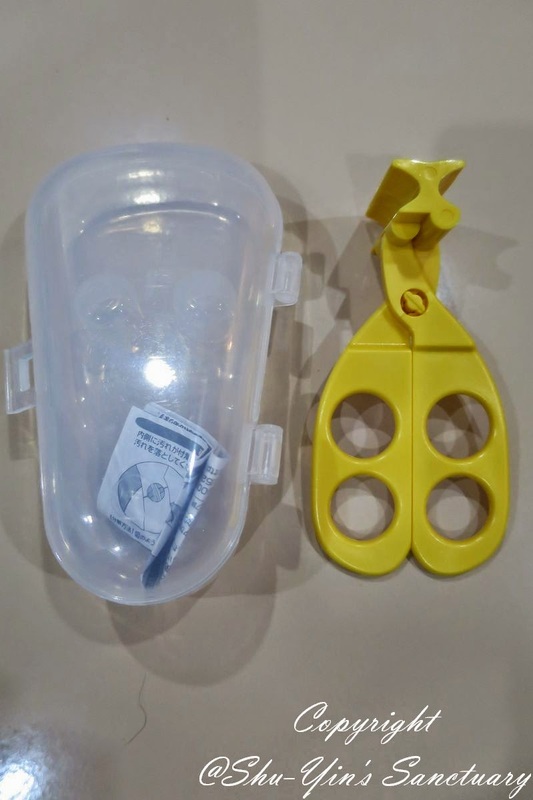 But I was pleasantly surprised and pleased at how a simple product proved to be so useful. This was what I saw the moment I opened the parcel. 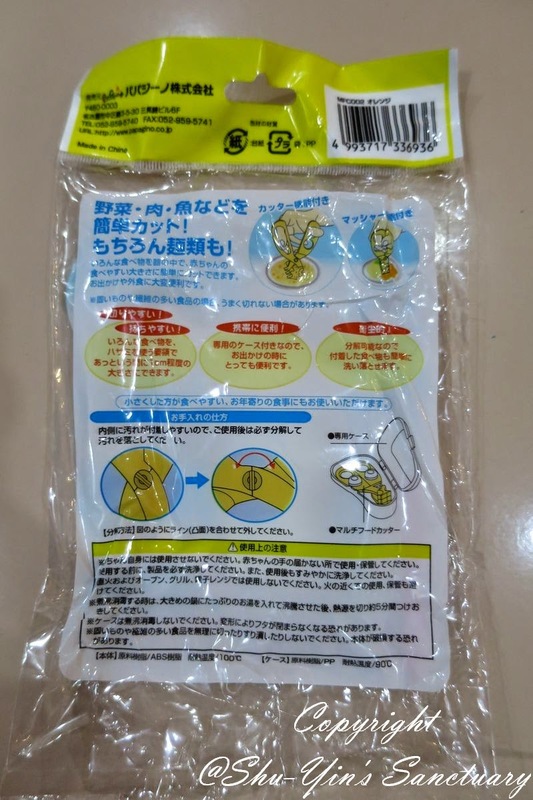 The plastic packaging was full of photos and instructions in Japanese! This is because this is a product from Japan. Although it is in a foreign language (I sure do not know how to read Japanese! 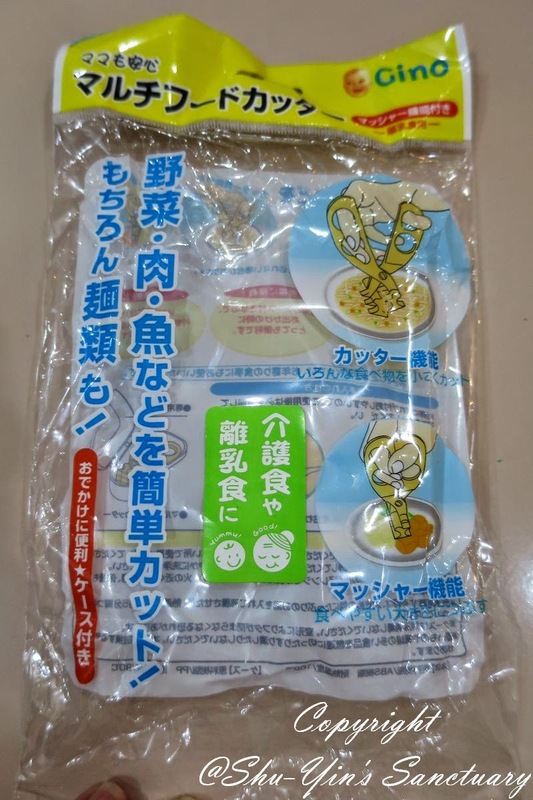 ), it is actually quite simple to understand the product with the illustrations on the plastic packaging . Upon tearing off the plastic, inside revealed a hard transparent plastic container. I like that this hard plastic container protects the multi food cutter inside. I also like that it comes with this container for easy and clean storage. 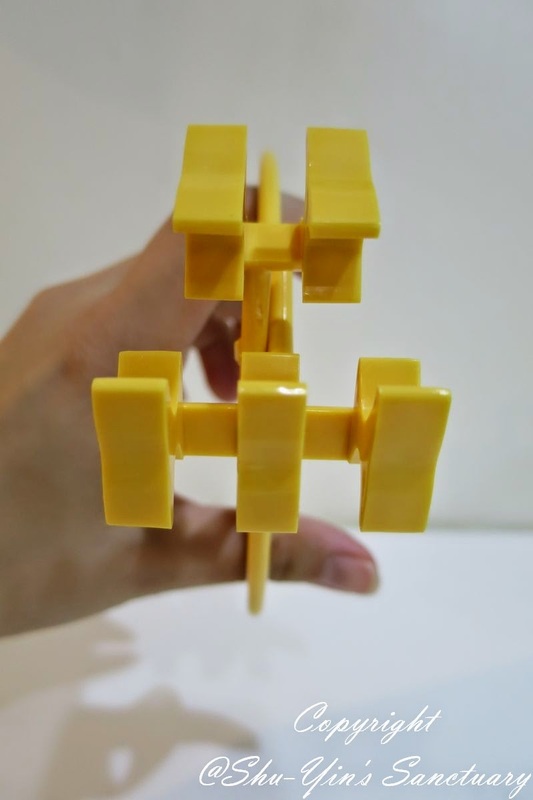 The Gino Multi Food Cutter is made of very durable plastic material, with soft and smooth edges on the handling area. It is very evident that it is of a superior quality, and not a flimsy product. 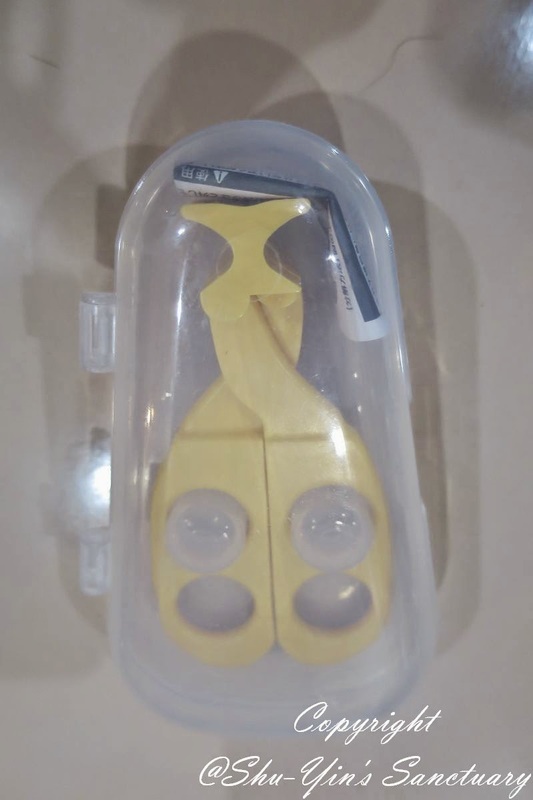 And as what the illustration on the plastic packaging tells us, this Gino Milti Food Cutter is an ingenious scissors with 2 great ways of using it, which is able to cut AND mash different kinds of food easily into bite sizes with ease. The photo on the left, with the scissors close, is how you mash and flatten the food. Just close the scissors and the flat surface will mash and flatten the food. And the photo on the right, with the scissors open, is how you cut the food. 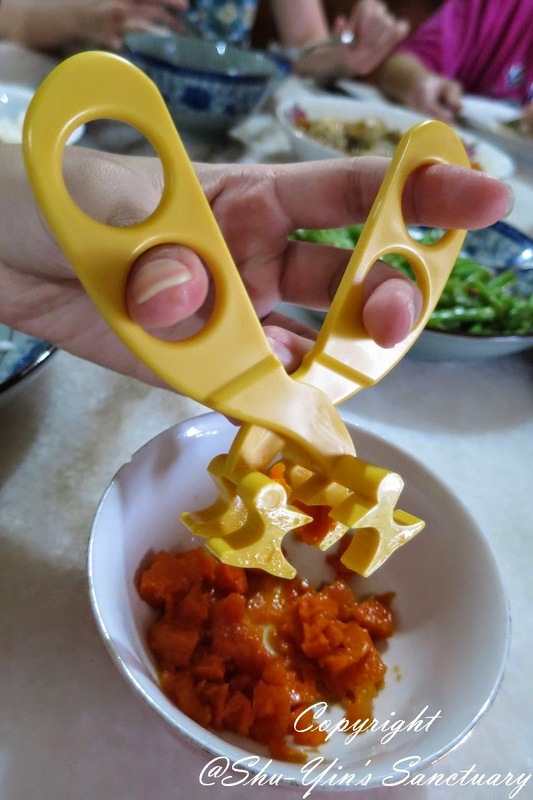 Open and close it like how you use a regular scissors and it will cut the food into pieces. This is a few closed up photos to show you how the mouth of this food cutter looks like. 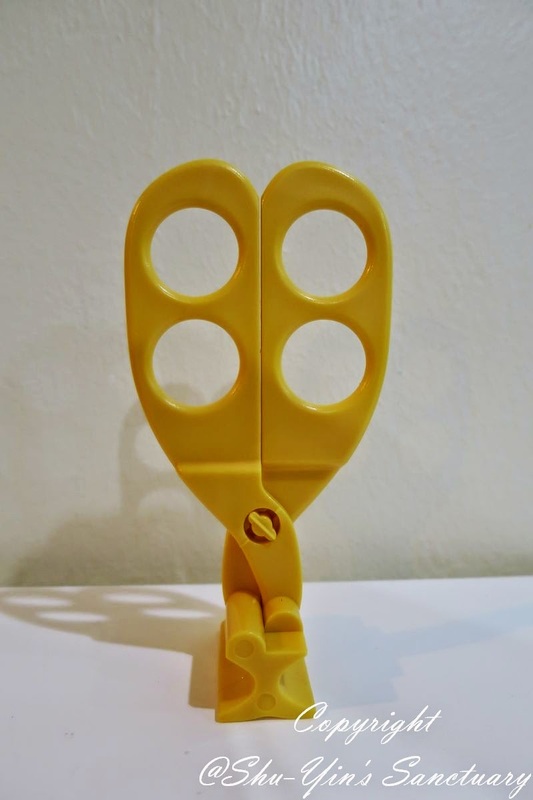 I also like that there are 4 holes for you to hold the scissors with your fingers. You can hold it anyhow you like as long as you are comfortable and the four holes are certainly enough to provide ease of using it. Now let's put it to test. 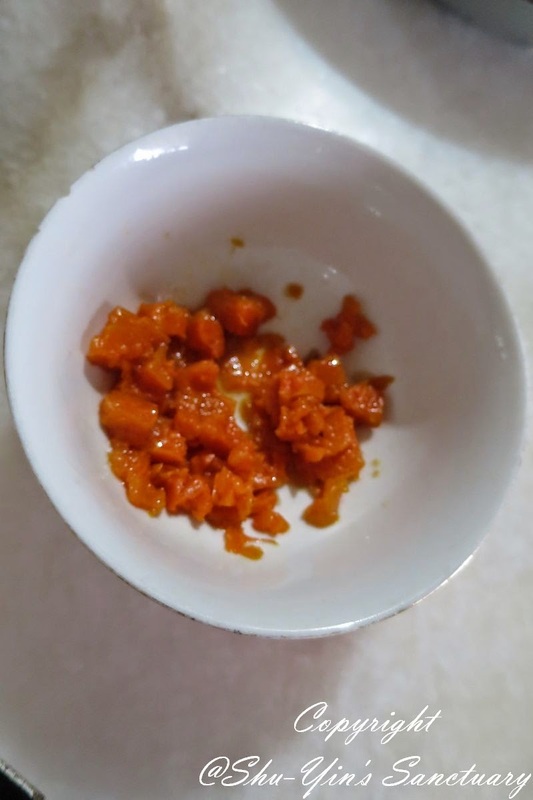 This is cooked carrot so is pretty soft. I didn't use it to flatten it as Khye was already having semi-solid food in bigger chunks by then. 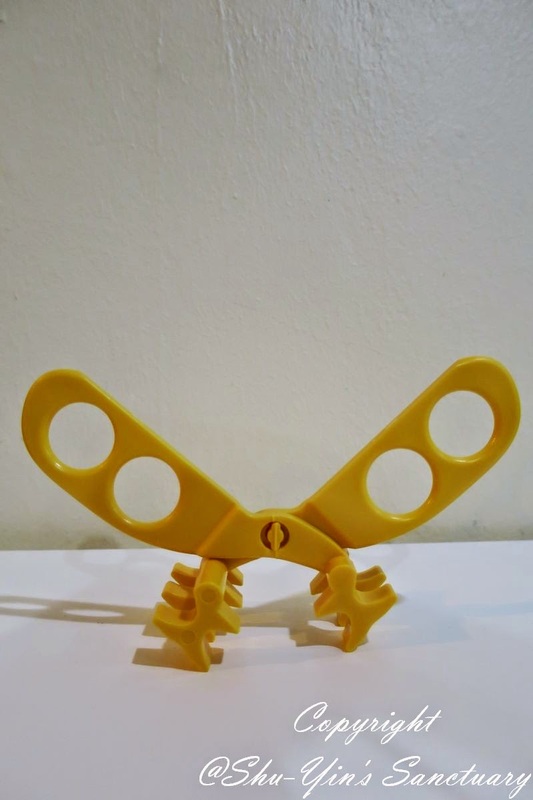 So I just used it as a regular scissors to cut it into smaller pieces. In less than 5 seconds, it was done. 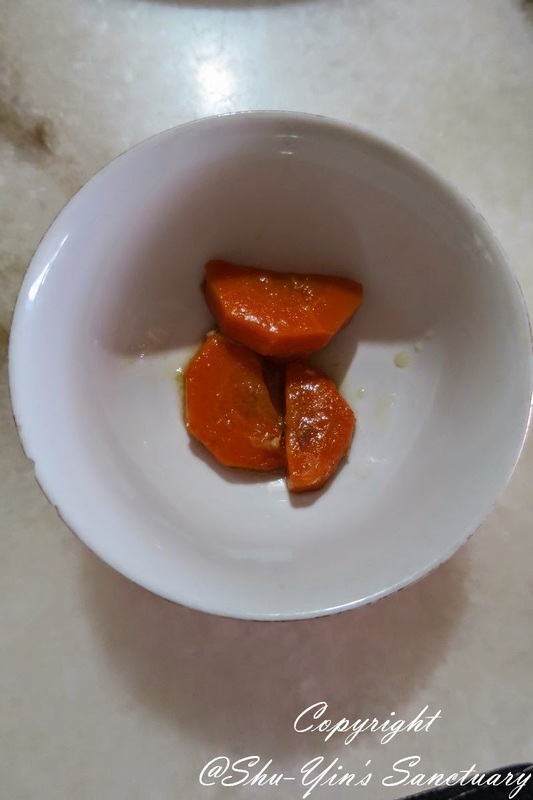 I was impressed that it took only less 5 seconds, as it usually takes quite a while longer for me to cut it using a spoon, which I normally did. 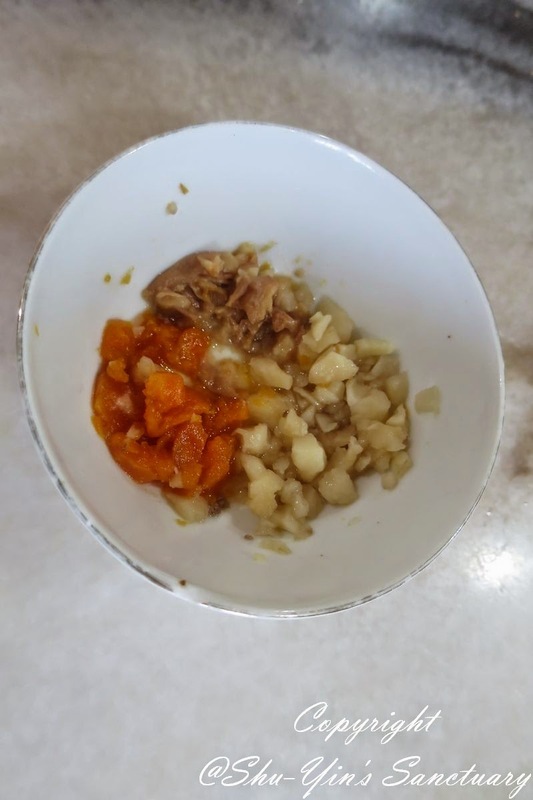 And here I was again, cutting 3 types of food - steamed carrots and steamed ground nuts, and also the water chestnuts. 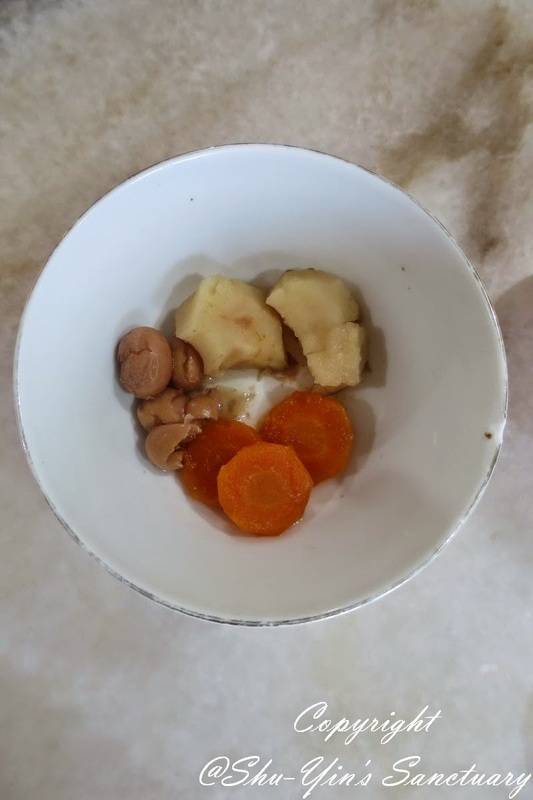 The steamed carrots and steamed ground nuts were soft so it was easy and fast. 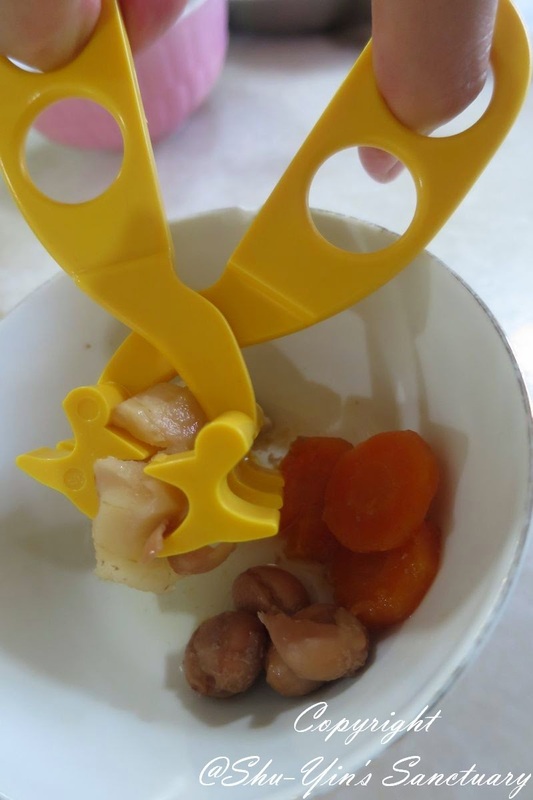 But the water chestnuts were still very crunchy but this scissors still did the trick! It was easy! In just a very short while, my food was all cut up into the sized that I wanted. 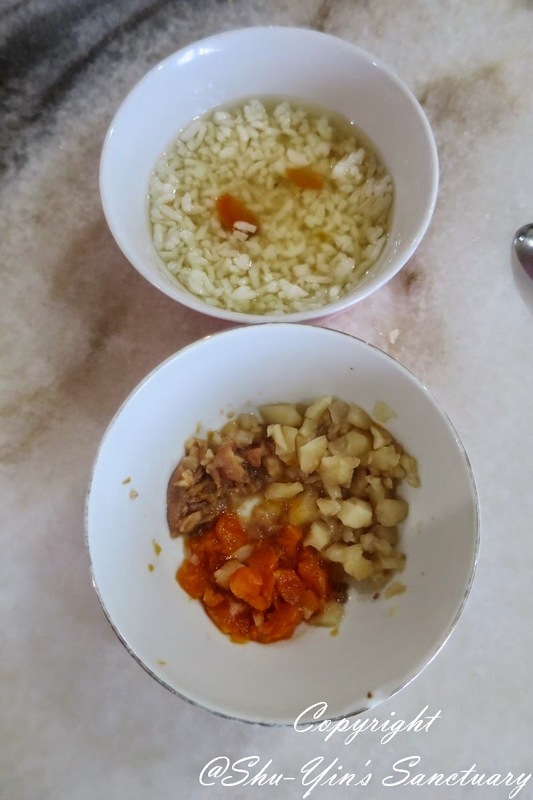 And I usually served it with rice for Khye. 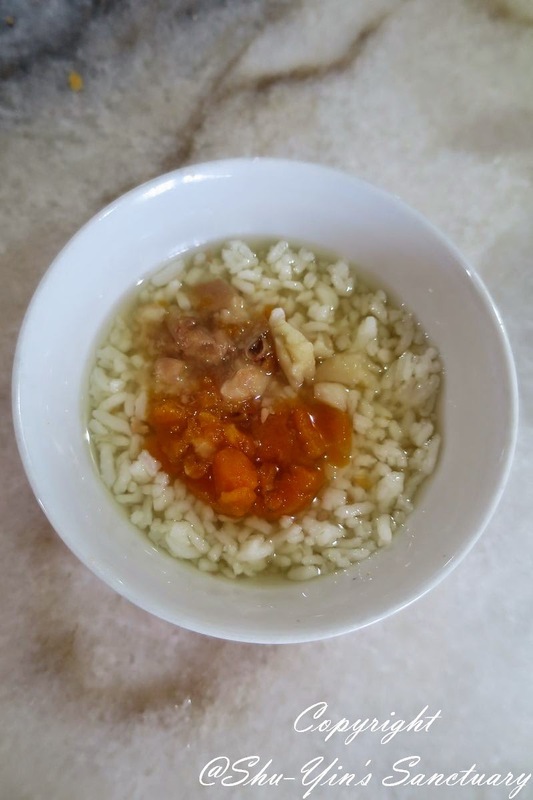 I poured the cut up food into a small bowl of rice with soup. 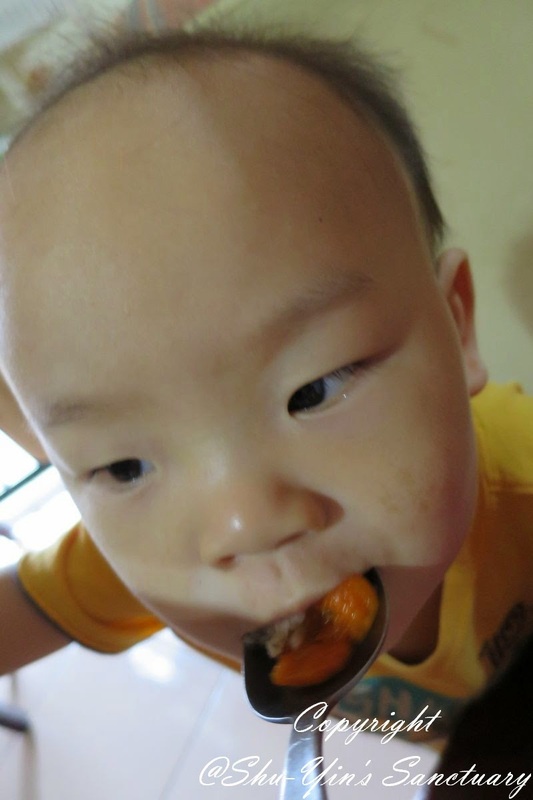 And Khye my fussy eater at that time, ate all up yummily. Next on, trying it out with meat. You know meat is not so soft and easy to cut into smaller pieces. 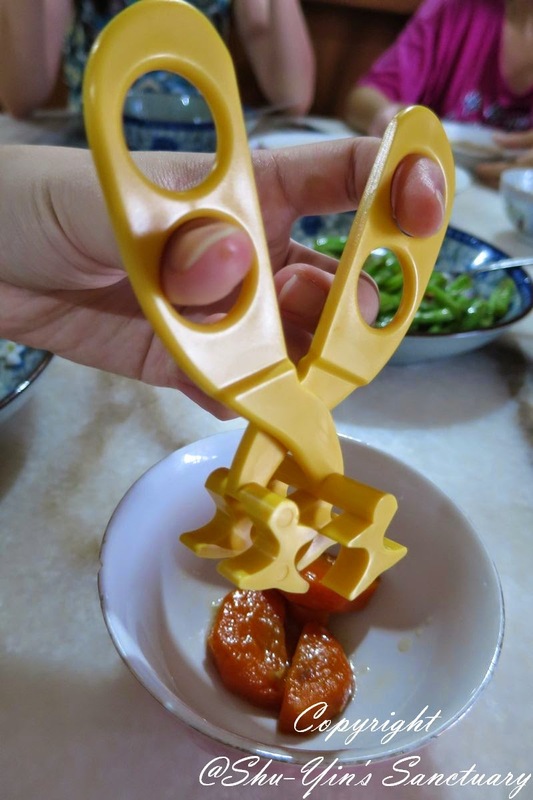 Usually I would use a small scissors to cut up the meat, or maybe I would use my hands and fingers for easier cutting up. 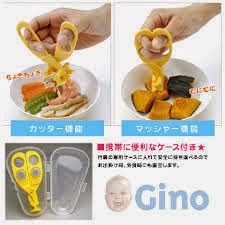 But now with this Gino Multi Food Cutter, no more using my fingers, and it cut meat so well! I think this is also a great product especially for babies who are still having mashed food, as it mashes food in seconds! 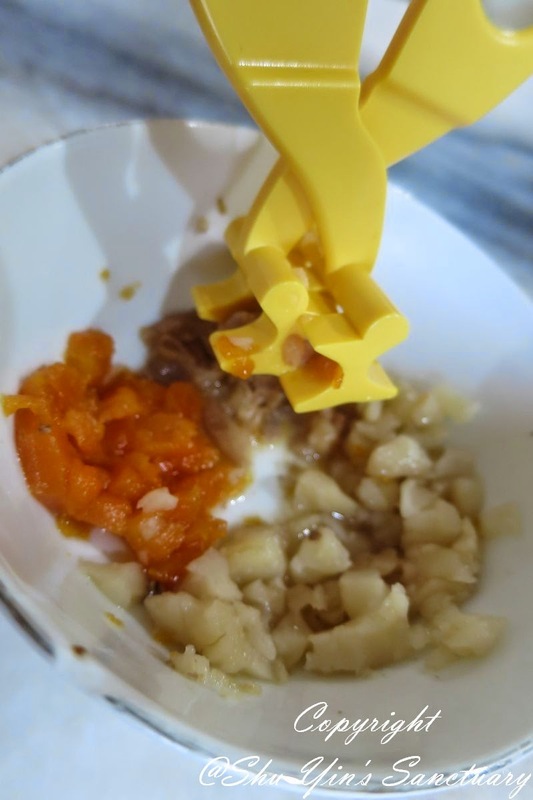 It is a simple tool which made mashing super easy, especially for mums who need to mash a big amount of food, and don't own a blender. It saves tiring hands! It is also a good use for the elderly who has not much teeth or with chewing difficulty. 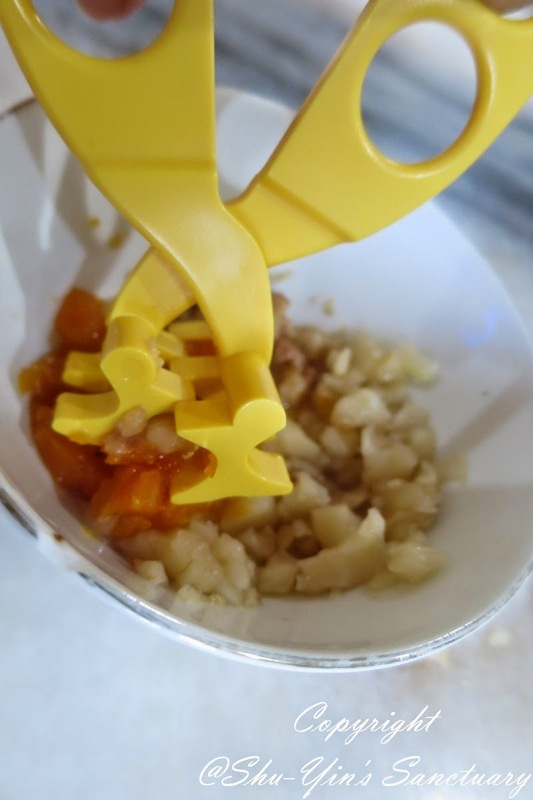 This Gino Multi Cutter cuts and mashes easily and very useful for the carer. 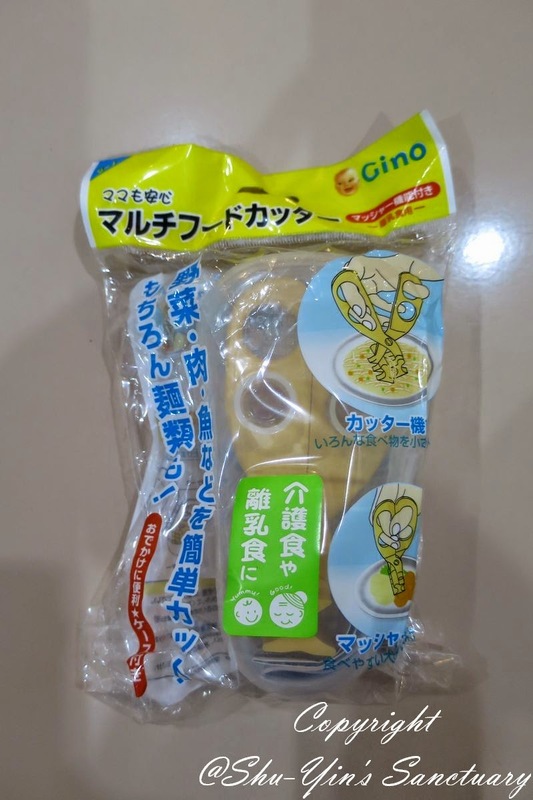 I'd tried using it on different food, be it fruits, vegetables and also noodles, and many more. It is also small enough to chuck it into your diaper bag or even your handbag for that speedy food preparation even when you are outside. It's dimension is only 133 x 50.5 x 210 mm. Another thing which I like is that it is sooooo easy to wash. Just rinse it with soap and water. Done. 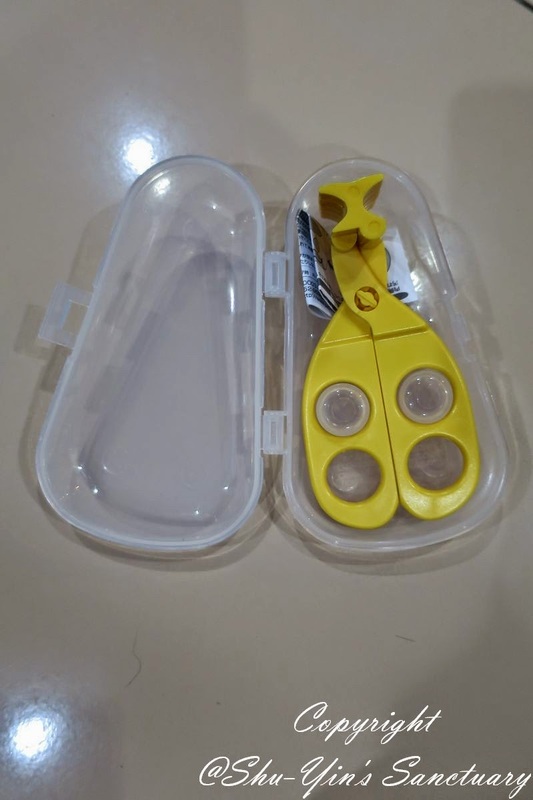 And if you are really particular, this multi food cutter can be dismantled for thorough washing by twisting the small little knob in the middle and it divides into two. Wash it thoroughly with soap and water and then twist it back. You can also rinse it with hot water to sterilize it. And my favourite of all it that I don't have to worry about rust, as there is no metal parts at all! How about that? 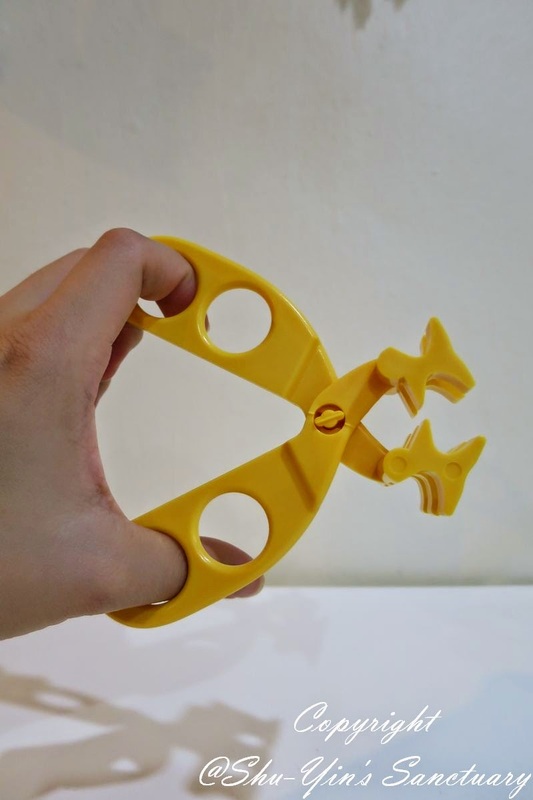 This multi food cutter is made of high quality ABS plastic. All in all, I think this Gino Multi Food Cutter is a nice added thing to have to make all mother's life easier. It is of such high quality, and with this price, it is actually a steal! You can get this Gino Multi Food Cutter from niceVIN. You can make a purchase through their Facebook Page, or also through their Website . I am pleased to announce that the nice people at niceVIN is sponsoring 2 pieces of GINO MULTI FOOD CUTTERS to TWO lucky winners! Giveaway ends on 20th Aug 2014 (Wednesday) 11.59pm Malaysian time. Please fill up the Rafflecopter below to to be eligible for a chance to win this giveaway! * Disclosure: I received a GINO Multi Food Cutter for review purpose, but no monetary incentive was received. All text and opinions are of my own and represents my honest opinion of the product(s). Your packing shows "made in China". Better to look for "made in Japan" one. Too many imitated products from China already.